Looking for a modern yet highly functional oval trophy case to house a collection of memorabilia, awards or retail merchandise? Our online catalog offers all kinds of showcases that will highlight just about any collectibles or objects. 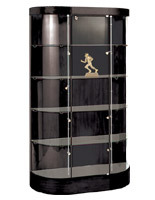 Our oval trophy cabinets feature curved designs that add a contemporary accent to existing furnishings and décor. As a result, these display cabinets are a great choice for any environment from retail stores to home offices. 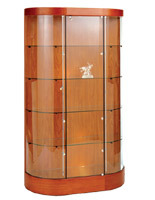 Wide oval trophy cases, some of our most unique display cabinetry models, are sold in a variety of finishes, so shoppers can get the models that work with their specific atmospheres or surroundings. The curved towers featured here are manufactured from high quality wood and are assembled prior to shipment. These trophy cases offer a clear view of exhibited contents, while keeping them out of harm's way. For this reason, breakable or exceptionally valuable merchandise are typically placed inside the locking cabinets. What features do these commercial quality showcases offer? These oval enclosures each have four fixed shelves that are made from tempered glass. In fact, all of the glass used during production is heat or chemically treated. This material is strong enough to hold reasonably heavy items and is safer in the event it is broken. Halogen top lights come standard on all of these models, but each option can be purchased with additional track lamps, as well. With either option, a switched cord is used to make changes to the lighting. A mirrored deck is situated at the bottom of every cabinet to reflect overhead or side lighting and add profundity to any contents. Solid back panels make these fixtures perfect for placement along walls. Wheels are attached to the underside of the display cabinets to allow easy maneuverability within a central location. These casters are different from others in that they are concealed by the bottom skirting. Wooden showcases like these are often seen in antique shops, museums, art galleries, homes, and other locations that call for protected presentations. Each wood design is available in one of four finishes, including silver, maple, cherry, and black. The variety of colors ensures that every store manager or homeowner will be able to locate the proper unit. In addition to the wide range of color choices, these display cabinets are equipped with interior lighting. Halogen lamps are affixed to the canopies, which helps to prevalently highlight presented merchandise. Some of the versions clearly have side-mounted track light systems in addition to the overhead lights that can feature single items. Trophies, awards, collectibles, and expensive goods are able to be displayed in a number of ways, as the glass shelves provided five levels of storage. The front door swings open and is equipped with a locking mechanism that gives the owner easy access, while keeping others out. What types of applications are ideal for these display cabinets? Retail locations and other companies often look for versions that are modern yet practical. Purchasing an option that offers the right amount of functionality yet still blends well with an environment can be challenging, but these showcases combine ease-of-use and style. A hallway at a high school or college is an ideal location for exhibiting trophies and awards. The illumination system on these models accurately highlights athletic and academic plaques, so students can be proud of their organization. Private collectors share their prized possessions with guests to their homes. The numerous finishes provide enough options to outfit any residence and do so with class. These wide showcases have a great number of uses in addition to retail stores, school settings, and residences. 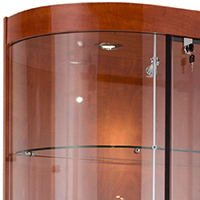 Against-the-wall display cabinets are ideal for jewelry shops, educational museums, and corporate office entryways. Museums set them up to exhibit ancient artifacts and relics without the risk of damage. Corporate buildings often like to honor employees and share company successes. Nothing says professionalism like a collection of awards, trophies, or plaques given to a business. The half moon shape is perfect for butting up to walls along corridors or hallways. And with lighting fixtures already designed-in, the showcases fantastic for locations that are not particularly well lit. The casters are yet another great amenity. All in all, these curved designs are some of the most modern and interesting display case styles for sale.